“Danish Paradise.” With apologies to Coolio. And to “Weird Al” Yankovic. Reel-to-reel. Undated. A discovery like this one isn't an everyday occurrence; I am immensely pleased to have made it. Some time ago, “Weird Al” Yankovic recorded “Amish Paradise,” a parody of Coolio's “Gangsta’s Paradise.” Some controversy followed, but I think it was mostly cleared up when it became clear that parodying the song does not amount to mocking the very serious plight of many inner-city African-Americans. When I was at the Huntington Library in California, a reel-to-reel audio tape fell into my briefcase. It appears to contain an early parody of either “Gangsta’s Paradise” or “Amish Paradise”—or some combination of the two. The voice sounds less like “Weird Al” Yankovic and more like a young, Velvet Underground-era Lou Reed, but it is still clearly not Coolio. 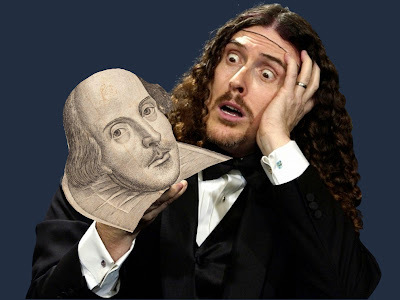 The song tells bits and pieces of the plot of Hamlet as if Hamlet himself were singing. The lyrics are provided below the video clip, which takes its images from Laurence Olivier's 1948 film version of Hamlet. Below that, you will find an alternate video clip—just in case the one below disappears—as well as embedded videos of the songs this song seems to parody. Enjoy! You wanna tell me what this play is about? I take a look at my skull and set the table on a roar. Even Ophelia thinks that my mind has gone. But I ain’t never stabbed her dad if he didn’t deserve it. Hiding back behind an arras? You know that’s unheard of. Or you and your new wife might drink some up. I really hate to be, but I got to be. You can see my solid flesh in my soliloquy, fool. Reciting lines in the spotlight. Living in this Danish Paradise. Where are old Yorick’s gibes? Not in this Danish Paradise. Killing in this Danish Paradise. I can't have a normal wife: I was raised in the court. So I got to get Ophelia to a nunnery. Too much behind-the-arras watching got me crazy, see? Got my sword in my hand and a mote in my eye. And Horatio is down, so don’t arouse my madness, fool. He’s praying now. Do it pat, or shall I wait? I’m in Act III now, but will I live to see Act IV? The way things are going, I don't know. The question you should ask of me? Vengeful in this Danish Paradise. Thinking in this Danish Paradise. Acting in this Danish Paradise. Talking in this Danish Paradise. Ophelia’s by the river, gathering her posies. Laertes, back from Paris, looking for some fencing. What’s going on here with Osrick? The ending is commencing. They say I got a speech, but nobody’s here to hear me. If everybody’s dead, they might just disappear me. I guess they can't, Horatio. I guess I’m dead—that’s why I know the rest is silence, fool. Dying in this Danish Paradise. Speaking in this Danish Paradise. Reporting in this Danish Paradise. When you leave this Danish Paradise. In case you need to refresh your memory about the lyrics of either “Amish Paradise” or “Gangsta’s Paradise,” I've embedded the videos for those songs below. Links: One year ago today at Bardfilm. Two years ago today at Bardfilm. Three years ago today at Bardfilm.